If you're in the healthcare industry, or even if you're just a patient from time to time, the lack of efficiency in some areas of this industry may be as clear as day. Fixing those problems is unfortunately not always as easy as identifying them. There is a way to gain efficiency in the Healthcare Industry, however, and we'll show you how. Do you ever wonder why you have clients filling out the same paperwork every time they visit the office? Forget the imposition on the client, the cost alone, to hire, train and retain the skilled employees that need to track and store the volume of paperwork being generated is excessive. Or worse, what if government regulations are not followed and an audit results in fines or closure? Fortunately having the right IT systems in place can address this issue. Using a document management system will facilitate both the collection and distribution of information, accurately and in a timely manner. By setting up an information architecture that supports your practice, the information that you gather can be easily located and easily updated directly into the system to avoid mistakes and data loss. It can also be accessed quickly in emergency situations and shared across the provider enterprise or with designated caregivers, with appropriate permissions and governance built in. Time is scarce and any opportunity to automate workflows can result in greater potential to see more patients, provide better care, reduce human error, and save time and money. While every patient is different, many of the processes you do each day are repetitive. Removing paperwork will certainly help generate efficiencies but there is more you can do. A document management system that is customized for your practice can offer file tracking, versioning, and auditing. Automated workflows can be set up to generate forms, reports, notes, prescriptions, etc. based on specific inputs. Most importantly, it will allow you to provide faster response to patients and providers and deliver a higher quality of service. With the number of patients that need to be seen on a daily basis, it's almost impossible not to run late on some appointments. With a high volume of paperwork, there are likely to be some discrepancies across documentation. And a discrepancy could result in making an inaccurate diagnosis or prescribing the wrong medication. And if you have ever been through that, you might also have a lack of trust in the information. Making sure patients are kept up to date on the status of their appointments or letting them know if there is a delayed start for their appointment would go a long way in terms of delivering high quality service. The right technology can provide status updates, just as the airline industry does for flight departure and arrival times. This would keep the flow of visitors to your office informed and less agitated, while reducing the stress of a long list of patients in the waiting room. Using the Dynamics Healthcare Accelerator, the same tracking system could also ensure that the data captured is accurate based on prior history. Artificial intelligence (AI) can alert staff when certain information is inconsistent or certain conditions are met, enabling better preventative care. Between medical devices, endless data and changing government requirements, it takes a lot of time and resources to ensure that your practice is in compliance with and prepared for an audit. The cost is significant and can rob you of time that could be better spent, on research, with patients, or with your own family. Wouldn't it be easier if all the information you needed was at your fingertips for an audit and little additional preparation was needed? With a file structure that allows for tracking actions across all documents, from viewing to editing, and one that is easy for auditors to search and review, minimal resources will be required to prepare. Not to mention, you'll benefit from a reduction of errors that can come from a traditional corporate filing solution that doesn't track versions or allow for permissioning to prevent unauthorized use. 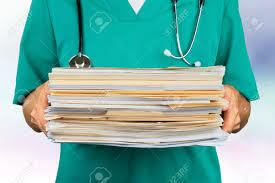 Medical documents involve sensitive information and strict regulations regarding privacy. It's difficult to be sure that the plethora of paperwork you retain over time is secure but at least you may feel like you have control of access. You may have even less confidence in storing information online where it could potentially be hacked or misused. Then there is also the possibility of a disaster, like a flood or fire, which destroys all of your documentation. At the end of the day, you just want to be able to do your job and feel good about the services you provide. With a cloud-based, customized document control solution, you can reduce paperwork (thereby reducing staffing and storage costs), increase productivity, reduce the stress of audit readiness, and improve security. As a result, you will be able to focus on providing high quality care to your patients.